The Day of the Hurricane. 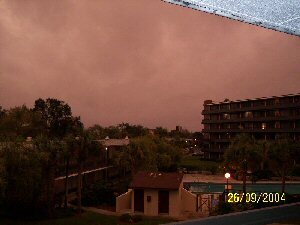 Hurricane Jeanne arrived sometime early during the night. Strong winds and very heavy rain. This was set to continue all day, so all I could do was to stay in and wait. I couldn't even watch any TV as all the stations were out. The TV was still out, and I could only pick up one faint radio station on the radio that was in my room. I did hear that the wind was blowing at 40 mph with gusts up to 60 mph. Soon after the power went out in the hotel. 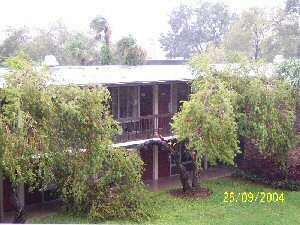 The rain was beginning to let up a little, though there was still strong gusts of wind and no power throughout the hotel. I just sat in my room and drew some doodles on a pad of paper I had. The worst of it was now over, the rain had turned to a light drizzle, and the wind had weakened, though there were still some strong gusts blowing around. Having a look outside it seemed that only one tree had been snapped. Though going outside showed differently. There were at least 3 areas of balcony that had been ripped off. Although there was still no power at this time, I think we were quite lucky. The rain had all but stopped. Though the wind still blew around the hotel. With no power, it was dinner by candlelight. After a wait of 15 minutes just to get in to get into the restaurant, it was plastic knives and forks, as well as plastic plates. It was a nice dinner though. The rain had now stopped and the wind was a lot lighter, though still blowing. There was still no power though. Many people were sitting out on the balconies, as this was the only way to get any light, and that was fading fast. Occasionally, the balcony lights would come on, to a cheer, only to go off a few seconds later. A nice bit of fun. What a day this had been!